Description: What am I going to study? This course is first of all an introduction to literary analysis; no previous experience in a literature course is expected. In addition to introducing how to read literature in an informed way, I will also take a look at how texts written in previous times inform how we read, write, and think today, and how those texts influenced writers and readers in other times as well. In reading samples of literature from the Middle Ages to the present, we will discuss how literature was produced and disseminated at different times, how the English language has changed, and how we use the concept of literary periods. Representations of love and war and of men and women at different points in time will be discussed in various types of literature. We will also focus on how texts from the past – in this case, medieval stories – become part of contemporary culture. A major section of the course will examine literary responses to World War One in poetry and fiction. We will explore answers to these questions: how was literature produced in previous times? How was it disseminated? How has the English language changed over the years? What terms should we use to refer to different literary periods? Texts: What books do I need? The books listed below are available in the MSVU Bookstore. A few of our shorter texts will be available online. You can see a list of specific texts we will be reading in the course syllabus, which will be handed out in class and posted on the Moodle site. Evaluation: What will I be expected to do? You need to be in class every day ready to work if you want to learn something and contribute to others’ learning, and if you want to be prepared for your writing assignments and exam. Attendance, of course, is part of your participation grade, but I will also take into account the quality and consistency of your contributions to class and group discussion and to Moodle discussions and responses. More details will be given in class. Demonstration of professional and courteous behaviour throughout the course will also contribute to this grade. Unprofessional and discourteous behaviour, such as texting, walking out of class in the middle of discussions, talking while others are discussing, watching non-course-related content on your computer, and not bringing the text to class, will have a detrimental effect on your participation and attendance grade. Attendance and participation grade: 10% of your final grade. In this course, you will have some options, so choose carefully. The class will be run very much like a workshop in which we discuss and then write about the texts. You will have 6 mini-essays, 5 of which will be done in class. We’ll practice and prepare for these essays in every class, and each essay will be a focused analysis of the texts we’ve been working with. I will count the top 5 of the 6 essays for your final grade. Of course, if you want to gamble, you can skip an essay. You will also be allowed to revise 3 of the 6 essays to improve your grades. Essay dates and revision due dates are listed in the Syllabus. More details will be given in class. Top 5 of 6 essays, including 3 allowed revisions: 50% of your final grade. The article review will be approximately 750 words long and will allow you to practice research and documentation skills. More details and practice will be given in class. Article review: 10% of your final grade. The final exam is an opportunity to think about the course readings in new combinations and from a broader perspective. Usually the exam consists of passages selected from ones that we have discussed in class and that you will be asked to identify, analyze, and compare. Obviously, the best preparation for the exam is attending every class, bringing the text with you, keeping up with the assigned readings, and taking notes on the class discussions, including marking which passages we analyze together in class, along with actively addressing comments made on your essays and exercises. The Registrar’s Office sets the date of the exam. Final exam: 30% of the final grade. The course outline will be handed out in class and posted on our course Moodle site. Please read the outline carefully for further course policies and the syllabus. 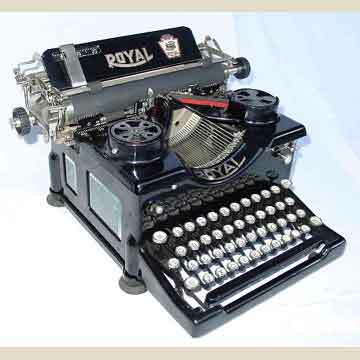 This image of a Royal 10 typewriter (1914) is from the Virtual Typewriter Museum.